So you want to travel to Abkhazia — but you’re not sure what to do, where to stay, or what to eat when you are there? You’ve come to the right place! 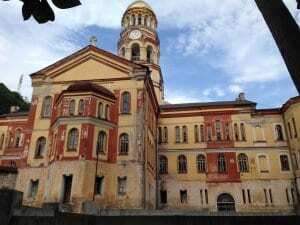 I visited Abkhazia in summer 2017 and put together this guide on how to make the most of your stay in Sukhumi and Gagra, the two destinations you are most likely to want to visit if you travel to Abkhazia. The highlights of any visit to Abkhazia are its amazing natural landscapes, and the contrast with the hauntingly abandoned buildings that dot those landscapes. You’ll also find some interesting foods to try, have a chance to take a dip in the Black Sea, and receive a warm welcome as one of the few foreign visitors to Abkhazia. 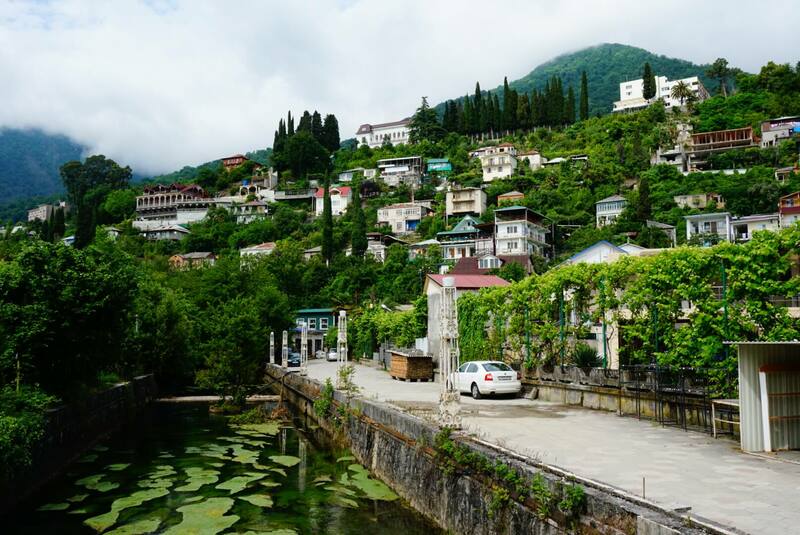 If you’ve recently been to Abkhazia and have suggestions for guesthouses, restaurants, or activities to add to this article, please mention them in the comments! 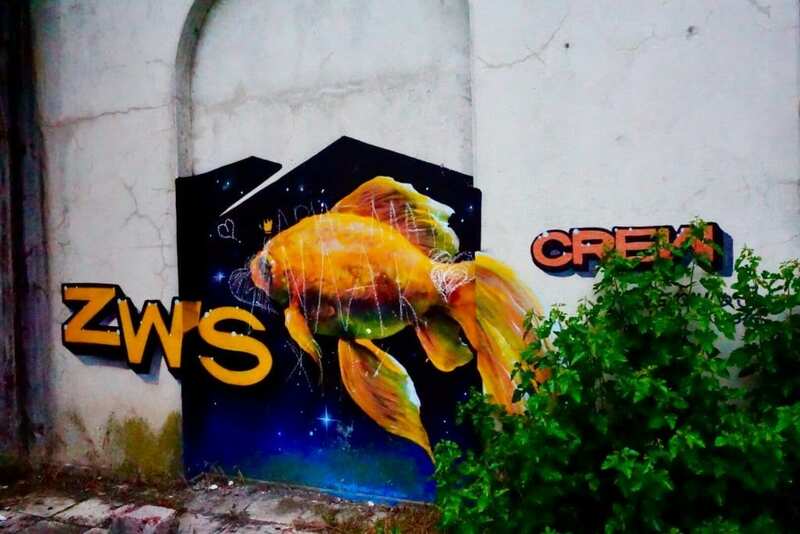 Things change in Abkhazia relatively quickly, and there isn’t a great deal of information on the internet, so help us keep this up to date for future travelers. Oh, one last thing before you dive in: given that there are some risks associated with travel to Abkhazia, it’s one of the places where I think it’s a good idea to buy travel insurance. Personally, I used a World Nomads worldwide plan, which a representative told me would cover Abkhazia. I figured it was a good investment given the fact that there isn’t consular support for many nationalities in Abkhazia. Abkhazia is a self-proclaimed republic on the Black Sea with a reputation for lawlessness. In 1992 and 1993, Abkhazia was the subject of a tragic war that resulted in over 8,000 deaths and most of Abkhazia’s ethnically Georgian population being forced out of their homes. 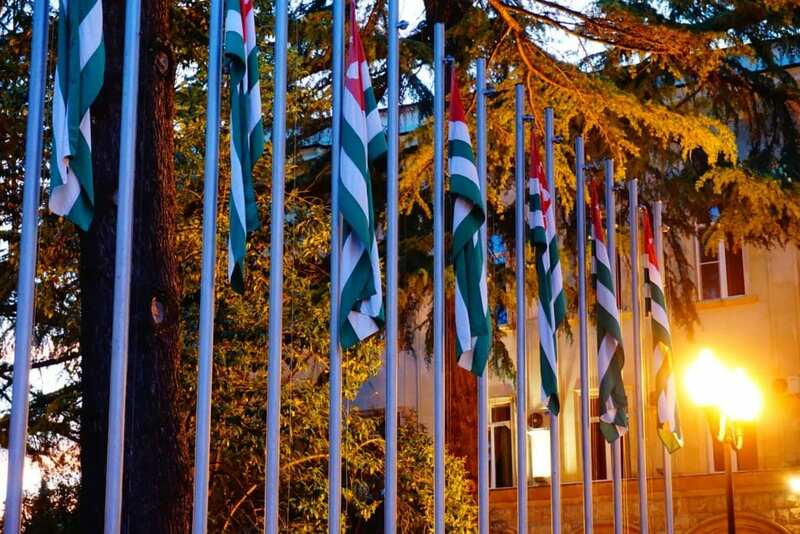 Today, Abkhazia is a self-proclaimed republic. But almost the entire international community considers it to be a part of Georgia, though Georgia doesn’t have any jurisdictional control over Abkhazia. Instead, Russia serves as the functional administrator for Abkhazia today. There are two ways one can enter Abkhazia: from the Russian border in the north or from the southern boundary near Zugdidi, Georgia. Both are overland, as there are no air or sea connections at the moment. Since Georgia considers it illegal to enter through the Russian side, I only suggest going through Georgia. To do that, you’ll want to closely follow these steps on how to go to Abkhazia over at Megan Starr’s site. 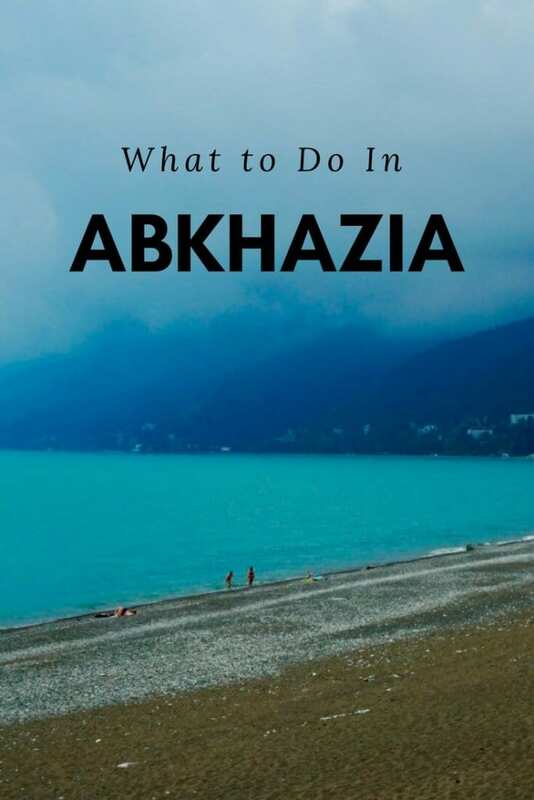 It’s the best guide I’ve found on getting to Abkhazia and she keeps it updated (I used a different site and I regretted it). 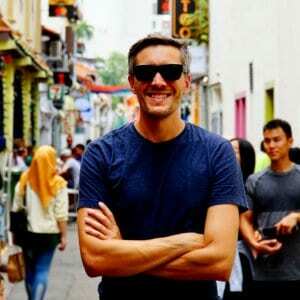 I recommend jumping to the bottom of the comments on that article, since things change fast and many travelers report their recent experiences there. Traveling to Abkhazia isn’t for everyone — in fact, you should know that both the US and UK governments warn against all travel there. But in my experience, it was a journey likely to fall well within the comfort zone of most experienced travelers. 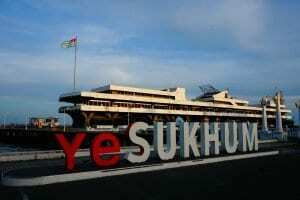 For most travelers, you’ll have to visit Sukhumi to pick up your visa. While you could just stay in Sukhumi the whole time, I suggest spending an extra night or two in Gagra. While there are also other locations in Abkhazia, these are the main places to stay in Abkhazia. Note that the southern part of Abkhazia is where the incidents prompting the travel warnings have occurred (especially at night). Though you have to go through Gali and the south to enter Abkhazia, and you’ll get a taste of the destruction caused by the war looking out the window of your marshtrukta, for safety reasons I wouldn’t suggest hanging around the south past dusk. 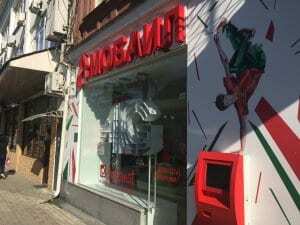 Abkhazia can feel a little expensive if you are a budget traveler who has been spending your time doing the many incredible and affordable things to do in Georgia. 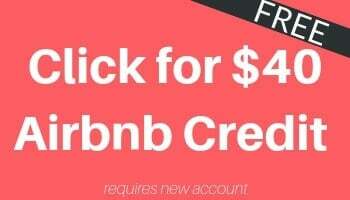 I have only listed options that you can book in advance online, but there are also many smaller guesthouses if you are the type who prefers to simply show up and walk around (usually that’s me, but in Abkhazia I think booking in advance is sensible). Comments: The location by the waterfront is very nice, and the owner speaks English. Comments: I stayed here and loved it. It is very clean, central, and comfortable with good WiFi. The ladies at reception don’t speak much English but are friendly and willing to use Google translate. It’s more than I normally would spend, but highly recommended if you can afford it. To get to Gagra from Sukumi, I had to get a taxi to the old abandoned railway station, where marshruktas took me for 200 rouble. Gagra is fairly small, so most places are within walking distance of the beach, restaurants, etc. I recommend staying in the northern half of the city. Note that Gagra gets so many Russian visitors (especially day trippers from nearby Sochi) that it almost feels like a tourist spot at times. Almost. Comments: If you don’t mind sharing a fairly small bathroom with the other guests, this is a great place. The location is solid, just one block above the main strip and thus within walking distance of the whole town. It’s clean and comfortable. There is a nice patio area to meet other guests, a kitchen, and a washing machine to do laundry. And the owner is an extremely friendly woman who speaks a bit of English. I stayed here and highly recommend it. Comments: This hotel seems to cater to Russian middle class tourists, but is a nicer place to stay if you prefer to live in comfort. The main attractions in Abkhazia are the gorgeous landscapes and, by contrast, the many hauntingly abandoned buildings. You can check out my post, Abkhazia in Pictures, for a photographic sense of what you can see there. 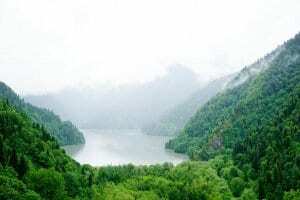 The top attraction in Abkhazia, by far, is Lake Ritsa. And for good reason. This stunning mountain lake used to be a summertime retreat for top Soviet officials. Stalin himself even had a summer home here. The easiest way to visit Lake Ritsa is as part of one of the many organized tours that leave from Sukhumi and Gagra. There are a small handful of companies that have websites, but I can’t honestly recommend any of them as their advertised prices are WAY higher than what you’ll pay if you book in person at one of the many stalls along the waterfront in Sukhumi or on the main road in Gagra. I paid about 900 rubles (16 USD) for a seat on a tour bus from Gagra. So my suggestion is to simply look for one of the many touts with signs advertising Lake Ritsa (as well as a number of other trips) and book directly with them. This is really easy to do in Gagra, as there are a ton of buses passing through that carry visitors from Sochi. There are less options from Sukhumi but you should find some choices if you keep an eye out along the boardwalk. The gorgeous drive up to Lake Ritsa is a big part of the reason for visiting as well. It is lined with many pull-over points to view waterfalls, forests, a bee-keeping farm, and a small but really clear “Blue Lake.” The tour buses make stops all along the way. The entire round-trip tour from Gagra takes about 7 hours, a bit more from Sukhumi. The route is plied heavily by tourists buses carrying visitors from Sochi, so don’t expect to have the nature to yourself unless you hire a private driver and hike to get away from the major stops. But that does mean the journey is very safe and comfortable. Overall, it’s a day trip that’s well worth it! Abkhazia is filled with abandoned buildings of every sort, hauntingly sad reminders of Abkhazia’s history. It is of course important exercise caution when entering these buildings. But many are relatively open and easy to explore. It makes for some interesting photos (and reminded me of what I experienced when visiting Chernobyl). In Sukhumi, there is a partially-abandoned pier (there is now a restaurant on top) located near the Hotel Abkhazia. 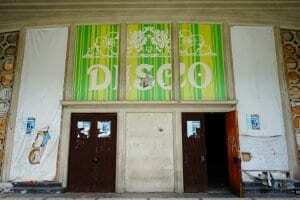 In Gagra, there is a fascinating abandoned disco located on Ardzinba Prospekt street, approximately near the intersection with Sukhumskaya ulitsa (note: if someone gets an exact address, please let me know!). Inside you’ll find an empty stage, a broken piano, and leftover theater seats. There is also an abandoned train station located just north of Kafe Ritstsa on Ardzinba Prospekt street (across from the monument). This is probably the safest abandoned building to photograph, since there are many people around and much of it is open-air. 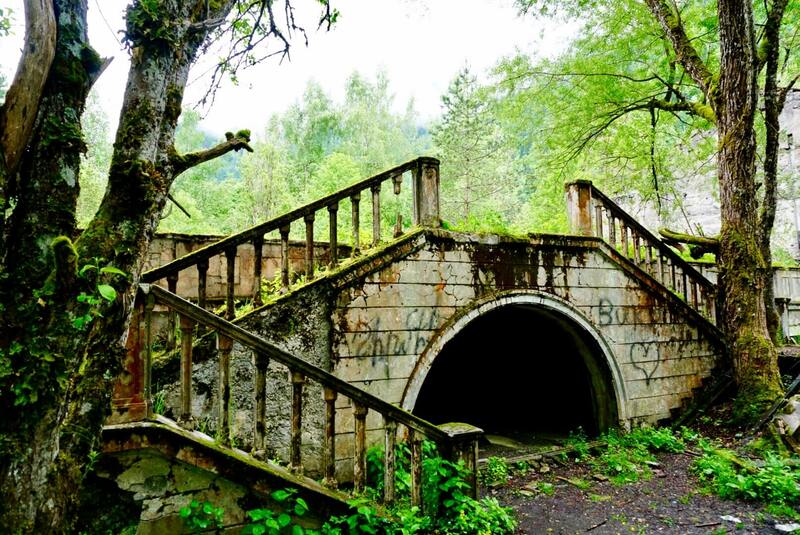 There are a lot of other abandoned buildings almost everywhere in Abkhazia, but just be careful when entering them! 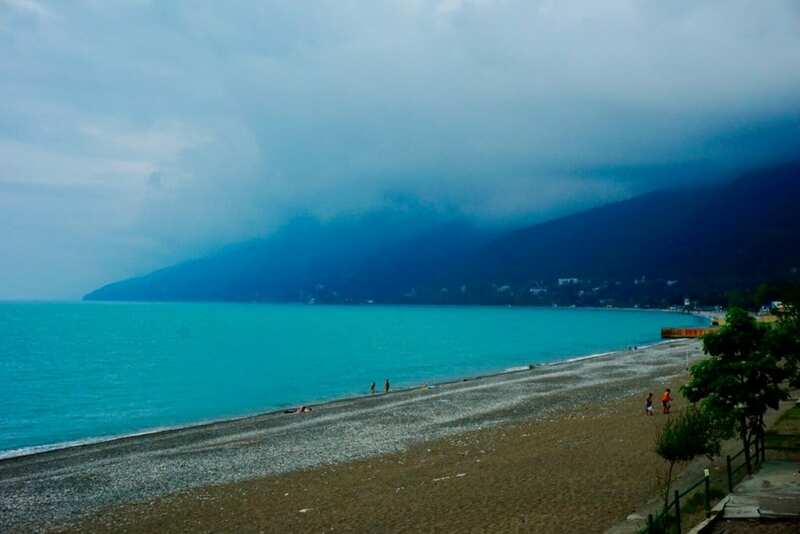 Before the war, Abkhazia — and Gagra especially — used to be a major beach holiday destination. The pebble beaches are very similar to the ones in Batumi, but not nearly as developed. Many Russian families come down for the day from Sochi to sun themselves on the pebbles or take a dip in the Black Sea. There is no sand to be had, but the water is a nice temperature! After Sukhumi and Gagra, probably the next most popular destination in Abkhazia would be New Athos, an ancient town located midway between Sukhumi and Gagra. You can visit as part of an easy day trip from either place, or you could stay overnight if you wish. You can take a marshrutka and do it independently or join an organized tour. The main site here is a pretty monastery dating from 1875. You can also visit Anakopia fortress, a thousand-year-old structure high on a hillside with some nice views. Lastly, there are some small caves that you can enter for 50 ruble. I didn’t visit these, but for what it’s worth my Russian friends were underwhelmed by them. Abkahzia is home to the deepest known cave in the world, Krubera Cave. It is possible to visit as part of an organized trip from Gagra, where I saw a number of touts advertising this. But I didn’t actually go myself, so I don’t know a lot about it. But you can find stunning photos of the cave taken by some serious spelunkers here. If you visit, please report back in the comments so we can update this! Abkahzia doesn’t get many tourists, and the ones that it does get come almost entirely from Russia. I found that both the locals and the Russian tourists were absolutely fascinated to meet an American there. Even though English isn’t widely spoken and my Russian is virtually non-existent, I had so many incredible conversations with people who were eager to talk with me. And I’m still in touch with the awesome Russians I met on my tour from Lake Ritsa (they even helped me put together some of the information in this guide). So don’t be shy when you inevitably notice folks staring at you — they probably would love to talk to you! Abkhazian cuisine is similar to Georgian food, though with its own regional flare. Meat-eaters will be pleased by the abundance of chicken and fish, but as a vegetarian, I was pleasantly surprised at the options available. Achma – a delicious cheese bread very similar to my favorite Georgian food, khachapuri. Achapa – this is kinda of like a cooked walnut salad of sorts. Very interesting textures! Abysta (mamalyga) – this is a cornmeal based dish used as a base for many plates. It more or less reminds me of polenta. Adjika – a pepper-based condiment that is very popular and a must-try in Abkhazia. Atshadzyua – a honey-based spirit that packs a kick. I didn’t exactly love it, but give it a shot! Kavkazskaya Kukhnya / Кавказская кухня (Ardzinba Prospekt, Gagra, just north of the abandoned train station) – a really excellent mid-ranged cafe serving Abkhazian food. There is a nice covered patio for sitting outside. Kafe Ritstsa (Ardzinba Prospekt, Gagra just south of abandoned train station) – this cafe has a great patio with views over the pebble beach. A nice place to hang out with decent WiFi if you need it. Lodochka (Ardzinba Ave. 203, Gagra) – a canteen where you can find Russian and local cuisine on offer for cheap. Leon (Chitanev 6, Sukhumi) – a nicer restaurant serving pasta and other Western food in Sukhumi. It’s attached to the high-end Leon hotel and it’s relaxed bar and patio is the closest thing to nightlife you’ll find in Sukhumi. In addition to the above, you’ll find many interesting street stalls and bakeries along the main streets in Sukhumi and Gagra. Modern western restaurants are starting to pop up everywhere as well, so you won’t be at want of quality food options in Abkhazia. Since it can be easy to get turned around in Abkhazia, and since English isn’t widely spoken, it’s enormously helpful to have a local SIM card so that you can look things up on the internet, use Google translate, etc. Fortunately, it’s really easy to get one. There is a new store in Sukhumi at 55 Aiaaira Avenue where you can get a local SIM card with solid data coverage for just 500 ruble. The women working inside were really helpful and even spoke pretty good English. Since it is just around the corner from the consulate, where you have to go to get your visa anyway, I strongly suggest taking a few extra minutes to get a local SIM card if you have a phone that supports it. Be aware of the political controversy surrounding Abkhazia. It’s been the subject of pretty serious tragedies, so tread lightly if discussing Abkhazia’s relationship to Georgia or Russia. Maps.me seemed to work better in Abkhazia than Google or Apple maps for me. And it works offline, so I suggest downloading it and pre-downloading the map for Abkhazia before visiting. Abkhazia is one of the most fascinating I’ve ever visited. It’s gorgeous, friendly, and hauntingly tragic all at the same time. While the safety concerns are real and worth heading, in my experience I felt perfectly comfortable and safe once I was in the north. While it isn’t for every traveler, I really enjoyed Abkhazia. For more information on Abkhazia, check out my Abkhazia travel diary or my post on Abkhazia in pictures. And if you’re journey is also taking you through the country of Georgia, be sure to check out my complete Georgia Travel Guide plus this list of 10 Incredible Things to Do in Georgia (Europe). Have you gone to Abkhazia? Let us know if you have any additions to the above information so we can keep this up to date for future travelers! Hey Nate, thank you for the detailed information, very useful to me as another American planning to go to Abkhazia! Question: what network the SIM card you bought operated on? I’m curious if it’s a Russian network and thus if I had a Russian SIM or roaming service with a Russian network (ex. TMobile’s international roaming), I’d just be able to keep using that. I’m not sure whether the SIM I bought was Russian or unique to Abkhazia (the brand is the red storefront in the photo I have there). I do know that TMobile’s international roaming most definitely did not work when I was there. I’ve asked some Russian friends if their SIMs worked when they were there and will let you know when I hear back. Let me know if you have any other questions and I hope you enjoy the trip there! I just want to know if I visit Abkhazia for a day, how am I to return back to the Abkhazia-Georgia border within 16:30 hrs on the same day? Do they have regular (hourly/half hourly) matrushka service from Sukhumi to the border? When is the train service from Sukhumi to Gali in the afternoon? Please help me as to how can I safely return back on the same day. Marshrutkas tend to leave when they are full and, while the service to the border is relatively frequent, you may have to wait. If there is a train service to Gali, I’m not aware of it (the only one I know of goes north to Moscow). Honestly, I would strongly recommend spending at least one night in Sukhumi. You may or may not have to wait at both sides of the border, and then it’s a bit of a risk as to how long it will take you to find a marshrutka. I always tell people to make sure that when they leave Abkhazia, they do it in the morning so that there is plenty of time to make it to the border even in the event of delays (which happen frequently). Remember that the border is NOT open 24 hours (be sure to double check the hours right before your crossing as they may change). Also bear in mind the safety issues near the border at night. In your case, even leaving when the border opens in the morning and returning early afternoon would leave you almost no time to explore Sukhumi. I suppose it could technically be done, but I think you’ll have a much better experience if you can stay a night! Please let us know how your trips goes.